“Similar, but yet so different at the same time.” This is how I would answer someone’s question if they asked me how this years Leechburg Super Regional event compared to last years. On the one hand, when I came into town I somehow brought the rain with me again. However, on the other hand, the area actually needed rain unlike last year when the rivers were flooding at nearly all time highs! 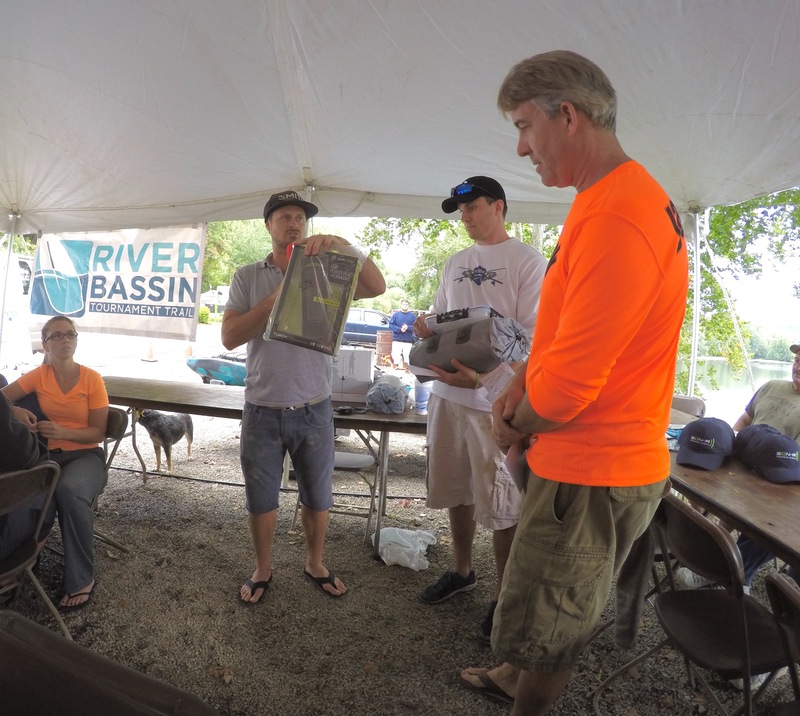 Last year, the winner found his fish in one of the larger pools on the Allegheny River and this year the river produced a winning stringer again, both in the team division and individual division. Last year the great folks at The River’s Edge, which sits right on the beautiful Kiskiminetas (Kiski) River, put on an amazing event complete with a large tent, DJ, catered food etc. This year was no different with some amazing food catered by the Johnson’s family catering business: No Bull BarBQue (724-344-8372). Tournament day started off wet again, but around mid-day the rain came to a stop and there was a perfect crisp fall feel to the air. Kayak anglers began scoring bass early and often with Greg Hall winning the Goal Zero First Catch award with his smallmouth caught at 7:01 am. 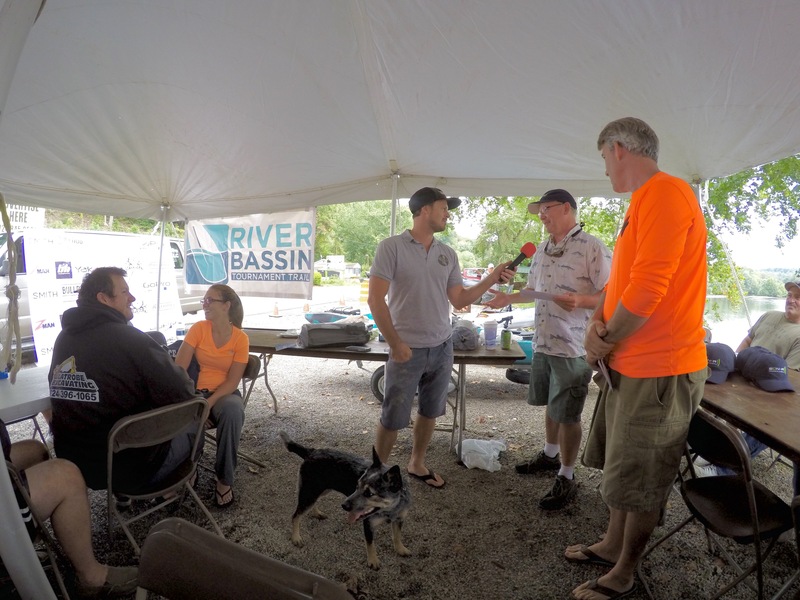 After Greg got the party started fish began to roll in via the River Bassin Trail live scoring system which keep fans up to date on the fish being caught in real time. When it was all said and done 98 smallmouth bass were scored for a combined total of 1309 inches! The event also saw 7 largemouth bass caught for another 103.5 inches. 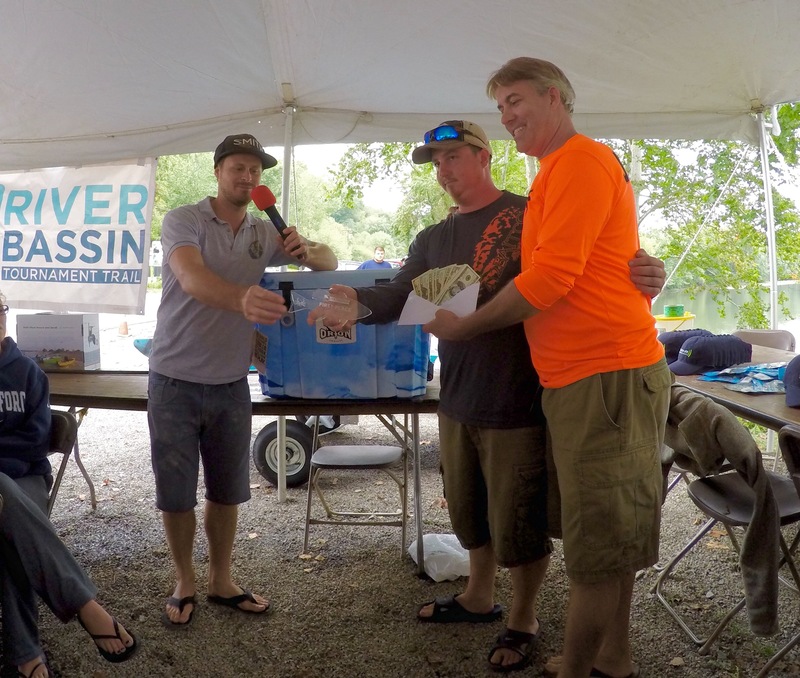 The largemouth actually turned out to be the big key in the Jackson Kayak team division, which was won by Eric Lander and Vald Golondrina of team Hobie Anglers, who took home $1000 in cash and some prizes as well. 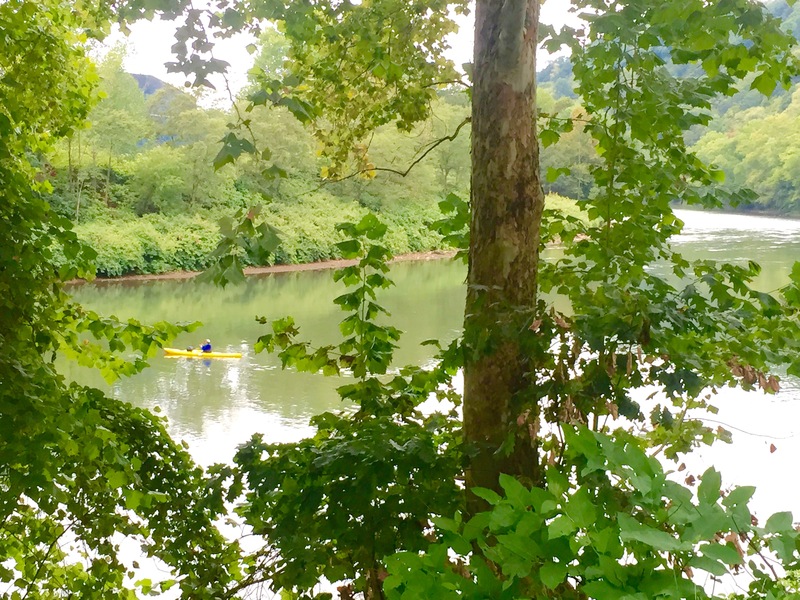 Even though Val had the overall bigger stringer of the two, Eric found 3 very solid largemouth in a slower pool on the Allegheny which turned out to be the difference. 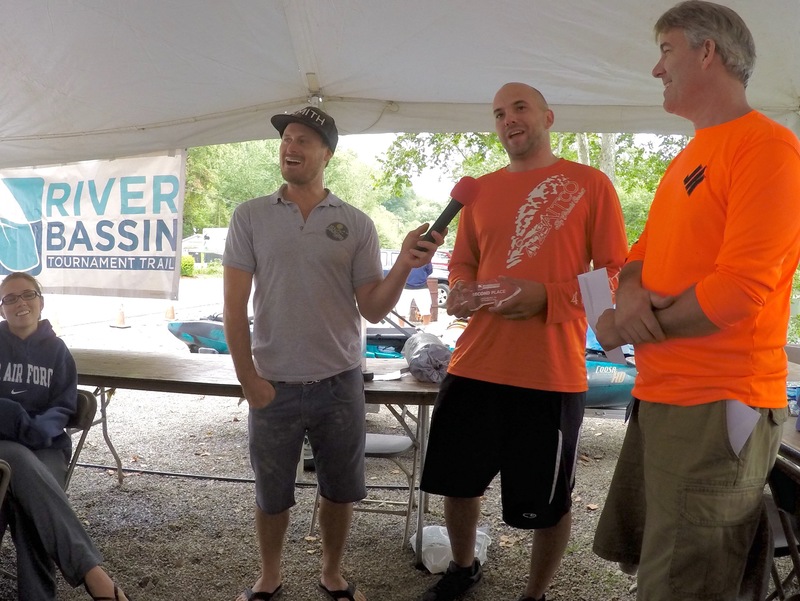 Further north on the river system is where team Bassnado (Joe Floriolli and Russell Johnson) could be found grinding it out to a second place finish with 86.75 inches. 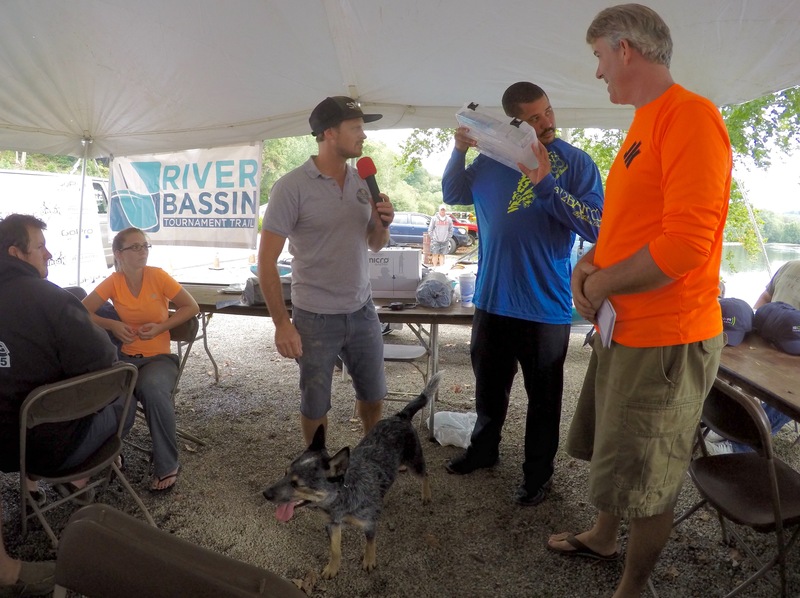 Thanks to another good finish the tandem is now sitting in 5th place overall towards the River Bassin Team of the Year award ($5000) which will be handed out to the top team after the championship event on October 24th in Tennessee. 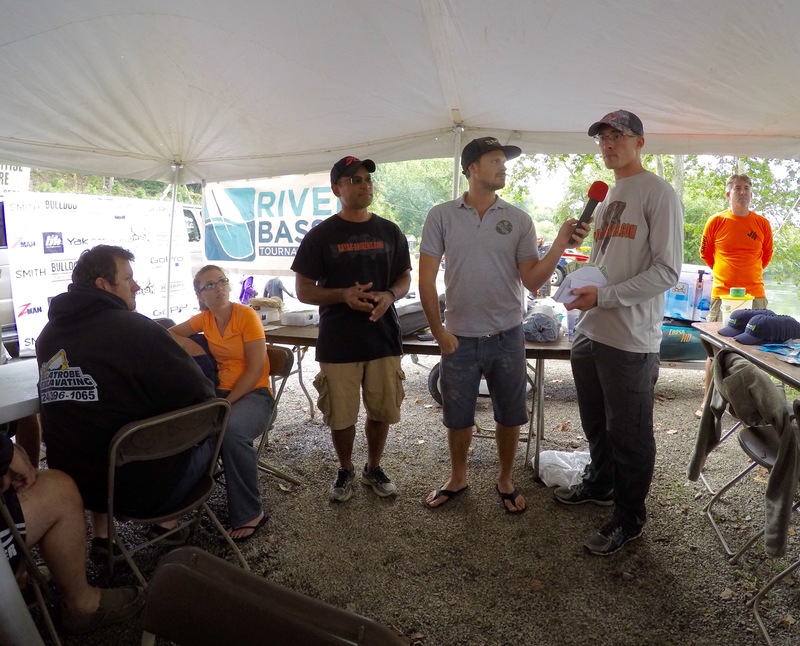 The championship is a stand alone event than any team or angler can enter to win some of the over $40,000 in cash/prizes! To view the fish and full standings from all the teams click this link. 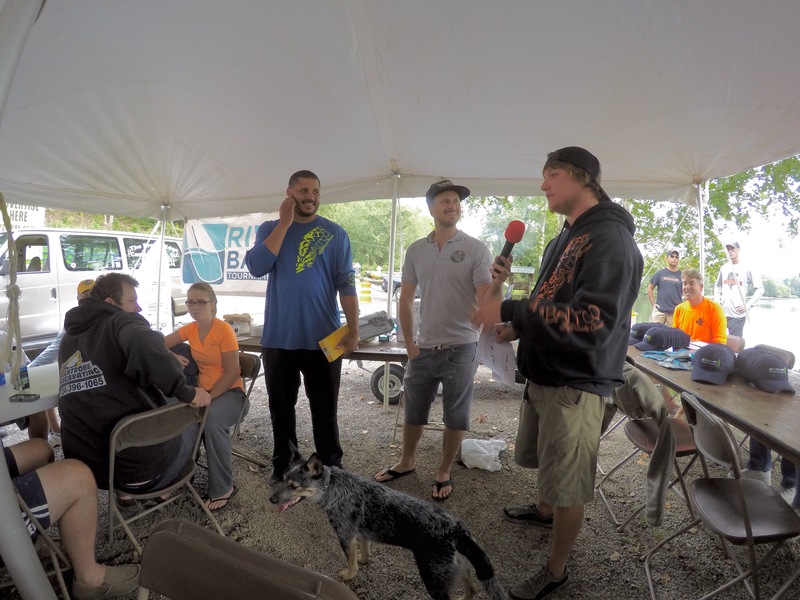 The Buck Knives Young Bucks youth division saw a familiar name atop the leaderboard; former multiple time youth division winner and overall event winner Dylan Crystaloski once again took the title! 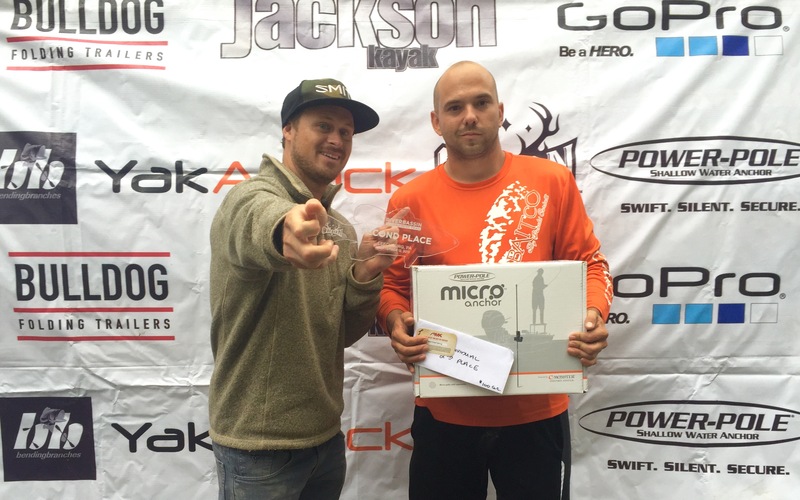 This year he had 42.25 inches which also put him 12th in the overall standings out of 52 anglers. Coming in second place in the youth division was Cameron Bush with a solid 3-fish stringer at 34 inches. Congrats to all Young Bucks! The Lucid Fishing top lady angler for the event was Megan Derry who finished with 38.25 inches, good enough to be in the upper half of the field at 21st place. Megan received a new Lucid Fishing fish grip for her efforts. 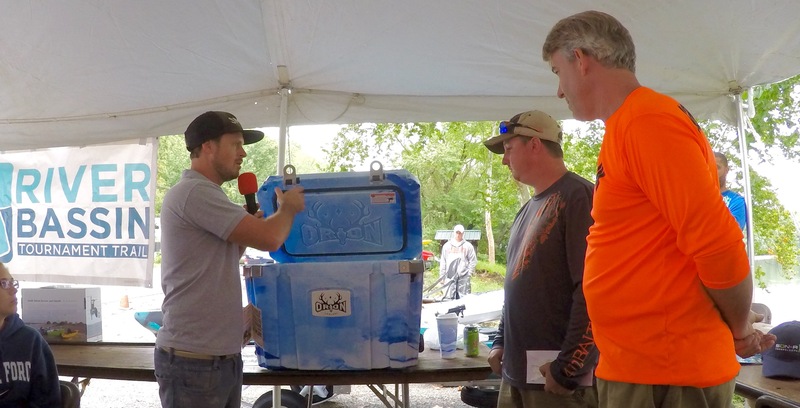 All that was left to be determined was the winner of the Orion Coolers Individual Division. All top anglers coming up on the stage talked about how the bite was good on soft plastic jerk baits, crawfish or topwater, especially early. There was one exception to the “early” bite and that was our eventual winner Michael Wegrzynek who found fish schooled up around 10:30am and was throwing a 412 Bait Co. Phase III spinnerbait tipped with a 3.5 inch Yoda. He caught both his big smallmouth (18.50 and 18.25 inches) almost back to back! That sounds like quite the 10 minute stretch! He later added on a solid 17-inch fish to give him a grand total of 53.75 inches! To no ones surprise Mr. 412 Bait Co. himself, Donald Corbett, finished in second place (52.75)and let everyone know that he did so by using a prototype buzzbait that he’ll be coming out with in the near future. 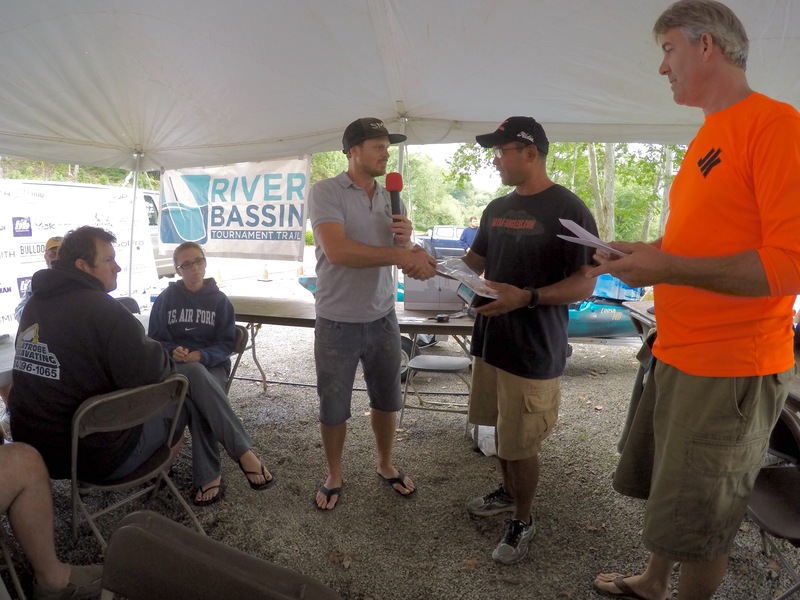 Third place belonged to the previously mentioned Vald Golondrina, who had a solid virtual stringer of smallmouth bass that came in at 49.25 inches. To see the full results in the individual division click this link. Other random awards we’re also awarded to the following. Z-MAN Random Timez bass was awarded to Dylan Crystaloski, who caught his fish at 1:53pm and the random time this day was 1:47pm. The RAM Mounts Random bass was awarded to John Harley who caught a 16.5 inch bass, which hit the RAM Random time right on the nose at 16.5 inches. 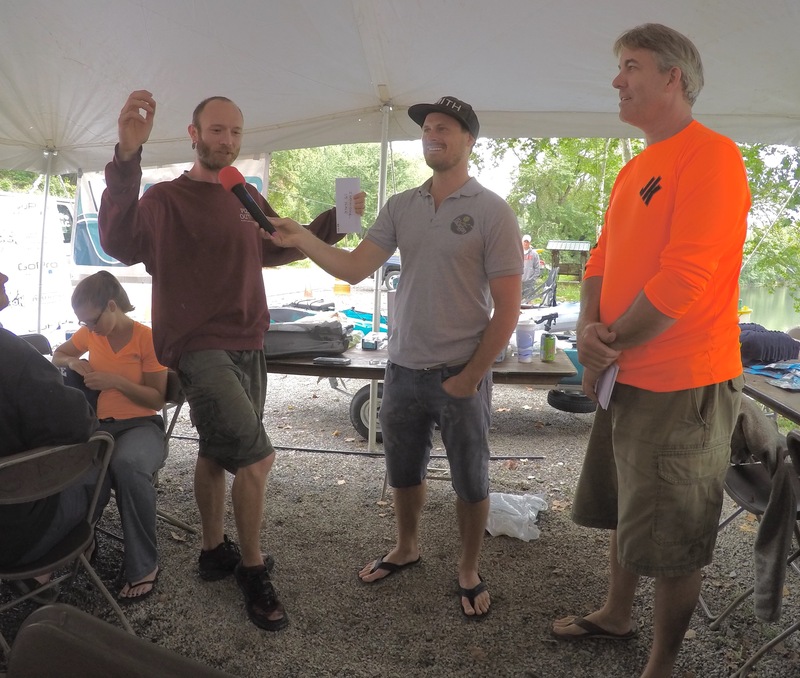 The Bending Branches Big Bass award also went to our champion, Michael Wegrzynek, for his nice 18.5 inch smallmouth bass. 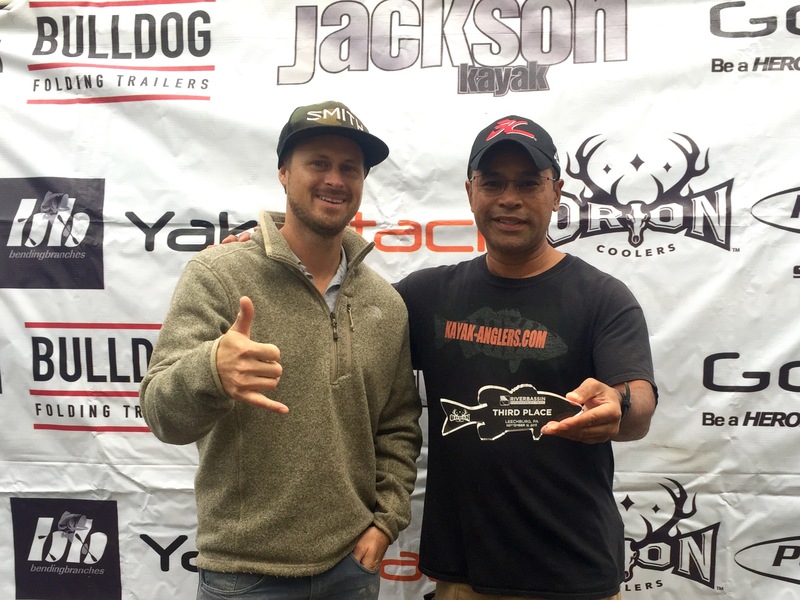 The Paddle4Tomorrow.org Jackson Kayak Coosa HD door prize winner was Chad Foster. 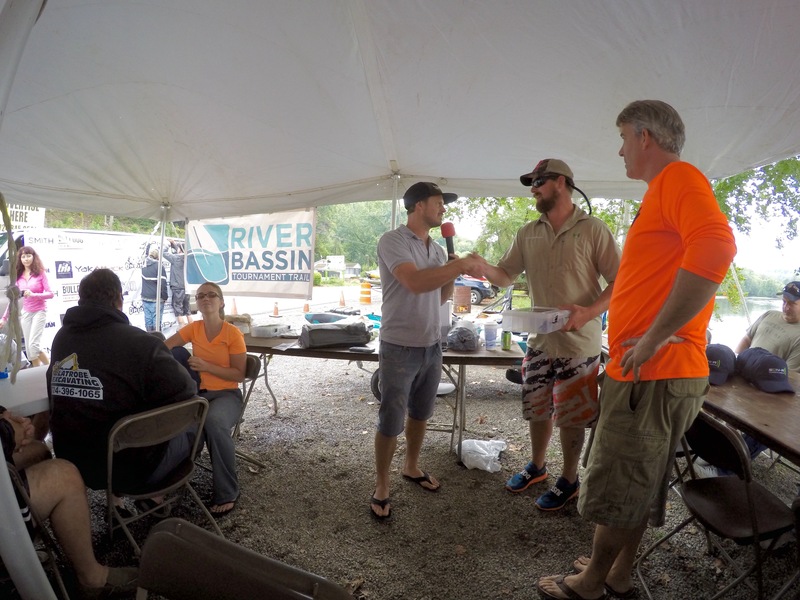 Over $400 was raised for Paddle 4 Tomorrow thanks to the generosity of these River Bassin anglers! Click on the photos below to see all pictures from the event.